We all know Bambi the cute baby dear and her rabbit friend Thumper and if you seen the movie then you know about the famous scene where the butterfly goes sit on the tail of Bambi. This t-shirt shows what really happened when the butterfly went to sit on the tail. Yes Bambi farted scaring away the butterfly and making Thumper laugh. And this fun scene is available on this t-shirt and it comes in men, women’s and of course kids versions in a bunch of colors and many sizes . If you want to show the world that even cute animals fart then you have to get this Bambi A Fart In The Woods T-Shirt. Your iPhone 4S or iPhone 4 look amazing but they could use some protection and what better way of doing this then by getting it a cute case. This case made by Speck will protect your phone and keep all the buttons and ports open for your use. And the whole back is covered in a fun design and as you can see it has a cute deer on it. Yes it is Bambi and she is surrounded by fun colorful squares and lots of flowers and other plants and if i look closely I can even see a frog jumping around. 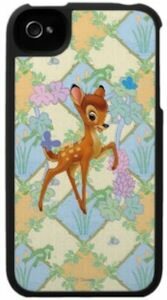 If you like a cute case and like Bambi then you have to check out this Disney Bambi iPhone Case. Finding the right key on a big chain of keys is not picknick. But if you get more personal keys this would be a lot easier. 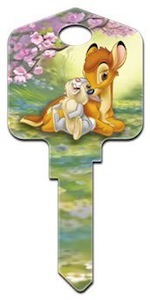 This key is a Bambi key and is colored all the way and shows a picture of Bambi and Thumper having a good time enjoying the flowers surrounding them. And this whole scene would be a perfect key for your home and it will be easy to find. This key of course is blank and needs to be cut by a place that cuts keys but after that you are all set with Bambi to guide you in. The Bambi key fits a standard Schlage lock. Now is the time to get a fun key so order your Bambi And Thumper House Key. This t-shirt show Bambi and a bunch of butterflies all having fun in a flower patch. And this t-shirt is not just for girls no you can get this t-shirt in all kind of styles, colors and sizes for boys and girls and for kids, adults and even babies. 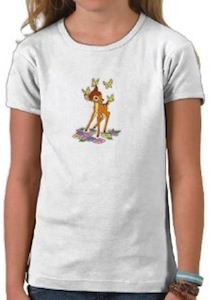 So if you like Bambi then you are in luck as this Disney t-shirt shows an amazing picture of you favorite deer Bambi. Come and check all the options and pictures of this Bambi And Butterflies T-Shirt. Kids play and play and then there is hole in the pants, sweather or jacket and now mommy need to find away to fix it. Clothing patches are an ideal sollution as they not only fix the fabric they also make it look fun. 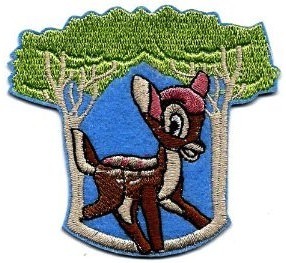 This clothing patch has Bambi on it the little deer from the famous Disney movie. You can attach this patch by simply ironing it to fabric or you can sew it on to make it extra strong. Of course you con’t have to use the patch to fix things you can use it make things look more fun to. Now you can have a Bambi hat, backpack, jacket and so on the options are limit less. 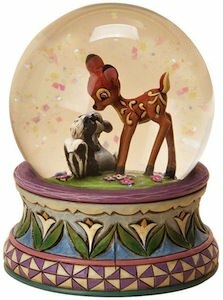 Come and have a closer look at this Disney Bambi Patch. Why still use boring mugs or worse paper cups? 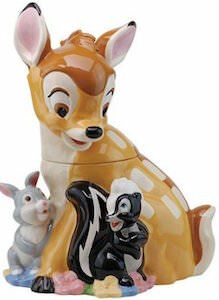 Just replace them all with fun mugs like this Bambi one. This white mug has a picture of Bambi on it and not just one there are two of the same pictures on each side of the mug. Now you have cute deer on your mug and that will make it you favorite drinking cup of all time. And of course this mug is microwave and dishwasher safe and comes in a couple of sizes. 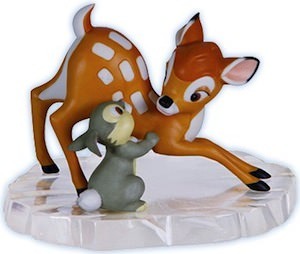 Don’t worry if you are a adult or a kid everyone loves Bambi. 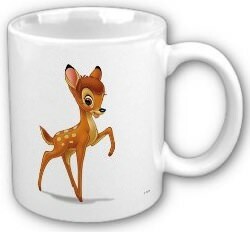 Get ready for a nice hot drink in your new Bambi Mug.